The 2015 vintage for Beaujolais is being hailed as one of the best ever by many lovers of these wines. Winemaker for Henry Fessy, Laurent Chevalier, told me it was the ‘perfect’ vintage with a long hot summer, just enough rain towards the end, and harvest in near perfect conditions. Quantities may not be huge, but quality appears to be high across the board, with the best wines outstanding. 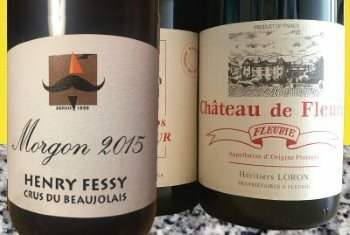 I recently had the opportunity to meet up with Laurent Chevalier and taste some wines, in advance of me presenting all 10 Crus of Henry Fessy from 2015 in a masterclass at my Glasgow Festival of Wine. I was also sent three samples of 2015 produced by the large négociant Maison Laurent. All six wines are Cru Beaujolais, coming from the top sub-zones that are entitled to their own appellation. (2017) From 50-year-old vines, this has a deep and vibrant crimson colour. I like the slightly herbal, sappy note of the nose that to me says 'Gamay' rather more than the Saint-Amour for example, earth, a touch of iron, and small, dry red berries beneath. Again charming, light, and full of that redcurrant and cherry fruit, a modest finish of spice, fruit and gentle tannins and acids. I prefer the style of this to the Saint-Amour, but I guess it perhaps lacks a tiny bit of substance, so I'll score it the same. Note:price and stockist quoted is for the 2014 vintage at time of review. (2017) This Fleurie is made in the Château's cellars, which belong to one of the Loron family. The Gamay is grown on pink granite soils and the wine vinified in old oak vats. It has a youthful crimson colour and pleasing, quite svelte nose of crushed black berries, cherries and a little graphite edge. In the mouth it is firm and racy, a fine core of acidity and taut tannin draped with quite concentrated black fruit. Elegant, fairly lean in style, and long. (2017) From 50-year-old vines grown on granite soils in Saint-Amour, this is dark, slightly duller in colour than the Fleurie. Vinous, with black cherry and a sense of richness, it seems more powerful but a touch less aromatic and refined. On the palate it is solidly fruity and relatively well-balanced, perhaps a touch chewy in the finish for Beaujolais, but concentration is obvious. (2017) From granite soils rich in large crystals, vines are 50 years old on average, and this was vinified traditionally (not using carbonic maceration). Beautiful ripeness is evident, and a liquorice intensity, though it begins to reveal a tiny floral lift on the nose. Weight and delicious persistence on the palate, with a sweet black cherry fruit and tartness of cherry skins, and that firm youthful finish. Price and stockist at time of review are for the 2014 vintage. (2017) Morgon, a village where all of the appellation's vines are situated, has slate soils that are rich in maganese. Once again the vines are quoted as being 50 years old, and the wine is vinified traditionally. Delicious aromas, lots going on and with an intense slick blackness and in the mouth, firm at the core, with plum and cherry skins. Taut stuff, glossy and ripe with such glossy character to the finish and again feeling as if it will age. Price and stockist quoted at time of review are for the 2014 vintage. (2017) From vineyards on sedimentary soils with old alluvial deposits, again vinified traditionally and coming from 50-year-old vines. A smooth and intense character immediately, with greater intensity and meatiness compared to the Fleurie, but a soft and ripe red fruit character comes through too. Savoury, taught on the palate it is really quite grippy, its tannin structure and acidity adding to that sense of concentration and fullness. This might age rather nicely for several years. The most recent vintage I can find for retail sale in the UK is the 2010.